Accessing climate finance at the local level is a challenge for many municipalities and this has impacted on climate action being implemented at scale. The majority of the large scale climate projects have occurred in metro municipalities, due to their larger institutional and resource capacity to acquire funds, however, even they have expressed severe challenges in this arena. Smaller municipalities are most constrained as they tend to be too small to apply for grants that require large scale implementation. Furthermore, due to their credit worthiness, they are unable to attain loans at attractive interest rates. These municipalities are also typically the poorest municipalities in the country, and therefore unable to use their own budgets to implement climate responsiveness to projects, rendering them the most vulnerable to the impacts of climate change. Over the past year, SEA and OneWorld under the V-LED project undertook extensive research on ‘localising climate finance’ to determine leverages of action that can assist in unlocking the flow of money to facilitate climate responsiveness at the local level. Several workshops were convened, bringing together national, provincial and local government to determine what funding options are available to municipalities, what the requirements and limitations are, and the opportunities and challenges that exist. The research shows that while there are various potential sources of funds such as domestic and international grants, loans and green bonds currently at the disposal of municipalities, these are often inaccessible and/or not appropriate depending on the typology of municipality or the project. It is difficult for small municipalities to access international funds from the Green Climate Fund, Adaptation Fund and Global Environment Fund for instance, due to the competiveness and the scale that is required to fulfil the requirements of such funds, unless municipalities cluster together and include experienced entities such as a metropolitan municipality, provincial or national government and/or private partners. For this reason, domestic sources of funding are much more desirable, however, there are currently limited domestic streams available which focus on building climate resilience. 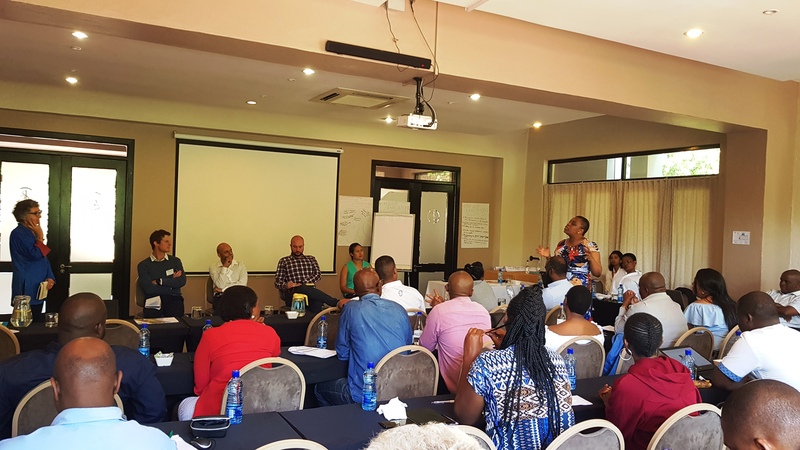 More recently, the V-LED project, together with DEA and SALGA convened a workshop in October to capacitate small local municipalities, district municipalities and provincial government on how to develop bankable climate response project proposals. This 1.5 day workshop, through a series of expert inputs and group work exercises provided vital input on the climate finance landscape and developing successful funding proposals for climate change projects at the local level. Expert input from National Treasury’s City Support Programme (CSP) shed light on their climate initiatives underway with climate proofing the Built Environment Performance Plan (BEPP) guidelines targeted at metropolitan municipalities. Participants also had the opportunity to engage directly with funders and funding intermediaries such as DBSA, SANBI, ICLEI Africa and C40, through a very lively and informative session where advice and hands-on tips to guide successful climate finance proposal writing were imparted to support officials. Advice included simple but often undervalued or ignored aspects among which included how to frame projects appropriately with clear and concise objective/s, use of language to demonstrate climate relevance, partnering and inclusivity, realistic budgets, and submitting a professional document that keeps to the requirements such as page/text limit. Drawing on the knowledge and insights from the expert inputs and the ensuing meaningful discussions at workshop, participants engaged in a guided practical group work exercise addressing the salient elements of proposal writing. Participants found this to be very useful, however, it is clear that much more technical support is needed in upskilling municipal officials in this area – a key factor that requires strengthening. A common theme that emerged from all municipalities was the lack of support for small municipalities in terms of capacity development, technical support, and communication platforms to enable municipalities to be aware of climate funding calls and other relevant information. While there are some existing avenues of support for municipalities through various donor organisations and ICLEI’s Transformative Action Program (TAP), these are ad-hoc and specific to the donor institutions, and usually accessible to member municipalities only. The workshop concluded with next steps on how to facilitate easier access to climate finance. SALGA is working with National Treasury in developing a Local Government Climate Finance Strategy to help alleviate the challenges linked to climate finance. Some options include the establishment of a climate finance coordinating body or support agency to assist with project preparation, bolster communications and provide technical assistance to municipalities. SALGA is also pursuing the feasibility of administering a Local Government Climate Change Fund. The topic of climate finance is still a relatively new one with steep learnings. While the V-LED project will be coming to an end this year, it is hoped that the learnings and insights gained from this overall project will continue to permeate and unlock the vertical integration governance dimensions necessary to advance climate change action at the local level in South Africa. It is the intention that the findings from the climate finance research undertaken by SEA and OneWorld will be used to influence decision-makers in the country and abroad. In the meantime, municipalities require the strong, relevant and coordinated support of national and provincial government in capacitating municipalities sufficiently so that they can be innovative in their approaches and mechanisms to fight climate change. Regulations need to work in the favour of municipalities to enable bottom-up local responses rather. While many metro municipalities are pushing the regulatory boundary, the majority still lack the knowledge and the political will to do so.